submit yourselves to your elders. 7 casting all your care upon Him, for He cares for you. 8 Be sober, be vigilant; because your adversary the devil walks about like a roaring lion, seeking whom he may devour. Observations: 5:5-6 Humility requires a trust that God cares for you, and will look out for your interests (verse 7). An incentive to humility is that pride gets God's opposition (and Satan's attention), while submission gets God's grace (both now and in the future). Submission (see sermon on the S-word on Truthbase.net) is yielding our rights for the purpose of protection and God glorifying unity. In a Body of believers, people need to be persuaded about their leaders (as being Biblical) and submit to them (or find a place where they can do that; see comments on Heb 13:17). Also, as members of a Body, one needs to be submitted to the needs and interests of the group (see comments on Eph 5:21). Body parts that are cut off or disconnected from the body shrivel and die. Application: Since independence is the essence of sin, avoid it by being dependent upon God and submitted to His will. How are you submitted to a Body of believers? Prayer: Heavenly Father, thanks for caring about the things that concern me; help me submit to the authority You've placed in my life for my benefit, and give me the grace to live as Jesus did, in humility. Amen. Revelation 12-15 These chapters form an interlude between the sounding of the seventh trumpet (last chapter) and the seven bowl/vial judgments which are contained in the seventh trumpet (chapter 16). John describes seven signs, three in heaven (12:1, 3; 15:1), and four on earth (13:13-14; 16:14; 19:20). The time sequence is interrupted to provide some ”background” scenes of things in the past and future. Many of the “vignettes” John presents are still future, but some occurred before John wrote as well. This post will reveal the unholy trinity of the Dragon/Satan, the Beast/Anti-Christ, and the False Prophet, as well as their attempts to control the entire earth. Those who receive the mark of Christ will be triumphant, while those who accept the mark of the Beast will live in torment. 12:1 A great sign was seen in heaven: a woman clothed with the sun, and the moon under her feet, and on her head a crown of twelve stars. 2 She was with child. She cried out in pain, laboring to give birth. 3 Another sign was seen in heaven. Behold, a great red dragon, having seven heads and ten horns, and on his heads seven crowns. 4 His tail drew one third of the stars of the sky, and threw them to the earth. The dragon stood before the woman who was about to give birth, so that when she gave birth he might devour her child. 5 She gave birth to a son, a male child, who is to rule all the nations with a rod of iron. Her child was caught up to God, and to his throne. 6 The woman fled into the wilderness, where she has a place prepared by God, that there they may nourish her one thousand two hundred sixty days. 7 There was war in the sky. Michael and his angels made war on the dragon. The dragon and his angels made war. 8 They didn’t prevail, neither was a place found for him any more in heaven. 9 The great dragon was thrown down, the old serpent, he who is called the devil and Satan, the deceiver of the whole world. He was thrown down to the earth, and his angels were thrown down with him. 10 I heard a loud voice in heaven, saying, "Now the salvation, the power/dominion, and the Kingdom of our God, and the authority of his Christ has come; for the accuser of our brothers has been thrown down, who accuses them before our God day and night. 11 They overcame him because of the Lamb’s blood, and because of the word of their testimony. They didn’t love their life, even to death. 12 Therefore rejoice, heavens, and you who dwell in them. Woe to the earth and to the sea, because the devil has gone down to you, having great wrath, knowing that he has but a short time." 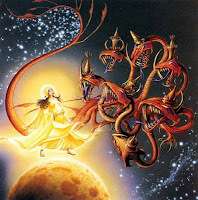 13 When the dragon saw that he was thrown down to the earth, he persecuted the woman who gave birth to the male child. 14 Two wings of the great eagle were given to the woman, that she might fly into the wilderness to her place, so that she might be nourished for a time, and times, and half a time, from the face of the serpent. 15 The serpent spewed water out of his mouth after the woman like a river, that he might cause her to be carried away by the stream. 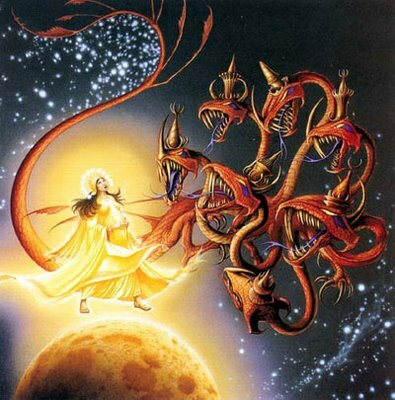 16 The earth helped the woman, and the earth opened its mouth and swallowed up the river which the dragon spewed out of his mouth. 17 The dragon grew angry with the woman, and went away to make war with the rest of her seed, who keep God’s commandments and hold Jesus’ testimony. Observations: 12:1-6 John sees a “great sign,” a woman clothed with the sun. This is representative of something else (that's what a sign is). The context would point to the nation of Israel. The sun and moon would be indicative of the glory God gave the nation. The crown of twelve stars are most likely the twelve tribes. She is in labor, about to give birth to a male child who will rule all the nations with a rod iron, which can only be Jesus. Psalm 2 makes that explicit, the Father installing the Son as King on the holy hill of Mount Zion (cf Rev 2:27 where Jesus quotes this Psalm as the basis of His power which He shares with overcomers). Another sign is introduced in verse 3, the great red dragon, which is identified as Satan in verse 9. The heads, horns, and crowns describe powers that rule under his authority (Dan 7:18-27 has the details). Verse 4 describes Satan leading a third of the angels to rebel (see verses 7-9). Satan sought to destroy Christ, but He was caught up (same word for “rapture” 1Thess 4:17) to God and His throne. Satan persecuted the woman/Israel, who fled into the wilderness, where she was protected for three and a half years (360 days to a prophetic year). This specific period of time would fit the last half of the Tribulation, when the anti-Christ (anti-Messiah) breaks the covenant with Israel. 12:7-9 John describes a “war” in heaven between Michael the archangel (Jude 9; Dan 12:1) and the good angels against Satan and the demonic angels, who lost, and were evicted from heaven. 12:10-11 Then John hears a voice announcing the arrival of the salvation, dominion and kingdom of God and of Christ. The reason for the announcement is that the accuser of the brethren has been cast down, which implies the salvation is the glorification (Heb 9:28) eagerly awaited by faithful saints. The saints overcame the accuser by the blood of the Lamb (which secured their forgiveness and relationship with God), and the word of their testimony, and their faithfulness to Christ, even though it resulted in death. Satan had no basis for accusation (see verse 17 below). 12:12-17 The heavens rejoice because Satan is cast down, but the earth mourns because of his activity there. He knows his time is short, so he does at much as possible to seek to thwart God's purposes and cause his own (usurpation of God) to be advanced. He persecutes Israel who is given divine protection so she can flee. Foiled again, Satan goes to make war with the rest of her descendants, described as those who keep God's commandments and hold to the the testimony concerning Christ. Application: Those who faithfully obey Christ will encounter demonic opposition, and usually divine protection (but not always if God wants them in heaven right away). Since failure to obey is spiritual suicide and enslavement to Satan, it's far better to die for doing what is right. Prayer: Heavenly Father, help me be loyal to You regardless of the presence or absence of opposition. Amen. 13:1 Then I stood on the sand of the sea. 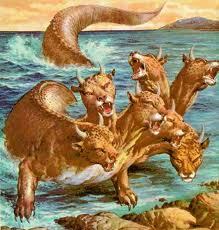 I saw a beast coming up out of the sea, having ten horns and seven heads. On his horns were ten crowns, and on his heads, blasphemous names. 2 The beast which I saw was like a leopard, and his feet were like those of a bear, and his mouth like the mouth of a lion. The dragon gave him his power, his throne, and great authority. 3 One of his heads looked like it had been wounded fatally. His fatal wound was healed, and the whole earth marveled at the beast. 4 They worshiped the dragon, because he gave his authority to the beast, and they worshiped the beast, saying, "Who is like the beast? Who is able to make war with him?" 5 A mouth speaking great things and blasphemy was given to him. Authority to make war for forty-two months was given to him. 6 He opened his mouth for blasphemy against God, to blaspheme his name, and his dwelling, those who dwell in heaven. 7 It was given to him to make war with the saints, and to overcome them. Authority over every tribe, people, language, and nation was given to him. 8 All who dwell on the earth will worship him, everyone whose name has not been written in the book of life of the Lamb who has been slain from the foundation of the world. 9 If anyone has an ear, let him hear. 10 He who leads into captivity, he will go into captivity. He who kills with the sword, he must be killed. Here is the endurance and the faith of the saints. 16 He causes all, the small and the great, the rich and the poor, and the free and the slave, to be given marks on their right hands, or on their foreheads; 17 and that no one would be able to buy or to sell, unless he has that mark, the name of the beast or the number of his name. 18 Here is wisdom. He who has understanding, let him calculate the number of the beast, for it is the number of a man. His number is six hundred sixty-six. Observations: 13:1-10 John sees the Beast come out of the sea (usual imagery for Gentiles) who is very similar to the dragon (12:3 -Satan) and Daniel's fourth and final beast the Anti-Christ (see comments on Daniel 7:19-25). John will revisit this character in chapter 17. He is ruler over Satan's world dominion, exercising his power through the ten leaders (horns) that many consider a revival of the Roman Empire. The Satanically energized Anti-Christ will receive what looks like a fatal wound, and experience what looks like a resurrection, which will cause all to worship him (and the Dragon who energizes him). As Daniel predicted, he will be given authority to make war against the saints for 42 months (three and a half years). The rest of Daniel's timetable was specifically and exactly fulfilled (once one understands the math; see comments on Daniel's seventieth week in Dan 9), so this looks like a literal period as well. There is no other explanation for the use of the specific numbers except to indicate the last half of the Tribulation. He speaks against God, His people, and His dwelling place (Jerusalem). All who dwell on the earth will worship the Beast except those whose names have been written in the Book of Life (register of the citizens who could vote or participate in the rulership of a city-state -cf Dan 12:1-2). Those who are faithful to the Lamb have their names in His book. The Lamb has been slain from the foundation of the world, meaning it was God's plan to have faithful believes rule with Christ in His kingdom, before creation. See comments on Ephesians 1 for God's master plan of glorifying Himself. Those who take the end of verse 8, “from the foundation of the world” which modifies the slaying of the Lamb, and move it to the middle of the sentence to modify the writing of the names, are totally deceived. They deliberate twist the text to present an idea that might be consistent with their faulty theology, but is at odds with all that we've seen in the Scriptures thus far (and we're almost at the end). Shame on you ESV. Anyone who has ears to hear will recognize verse 9 as a call to faithful and painful discipleship (cf. Lk 9:23). Verse 10 is a promise that God will execute justice. 13:11-15 John sees the third member of the unholy trinity, another beast arise from the earth (in contrast to the sea, possibly indicating a Jew). This is the False Prophet, who has two horns like a lamb, probably symbolic of a religious figure, and speaks lies like the Devil (that about settles it). He will exercise the Dragon's power which had been given to the first Beast (the Anti-Christ) to cause all who dwell on earth to worship the Anti-Christ. The signs and wonders will deceive even the remaining Jews to engage in idolatry. Satan can do miracles, and those who base their spiritual experience on signs, wonders, and miracles, will wind up worshiping demons. Only by knowing the truth of Revelation can one interpret spiritual experience correctly. No one knows that they are deceived (Duh!, that's the whole point of deception). Without the light of God's truth illuminating events and experiences, people stumble in the dark. It should be obvious that if someone's perceptual grid says that anything miraculous is from the Creator God, that exposure to miracles (real or feigned) will cause that person to worship the miraculous, thinking it is from God. It is more likely than not the false god of this world, or one of his demons, rather than the Creator God. Anyone who won't worship the Beast gets an expensive one-way ticket to martyrdom (it costs them their life, but it will be totally worth it). 13:16-18 The Dragon or Satan usurps the life giving role of God the Father, the Beast or Anti-Christ, usurps the Kingship of Christ the Messiah, and the False Prophet usurps the confirming and motivating role of the Holy Spirit. To ferret out those who won't worship the Beast and the Dragon through the false religious system of the False Prophet, the banking and commerce system is made to serve the terrible trio. Everyone is given the mark of the Beast on their right hand or forehead, so they can't buy or sell without it. Tribulation saints will have a difficult time keeping body and soul together. The name or number of the beast is 666, and John invites all math buffs to calculate. Bible numerologists say that six is the number of man, and seven is the divine number, so the unholy trinity will fall short of the holy Trinity. When I finish obeying Matthew 28:19-20 I'll dust off my calculator, but by that time the answer will be obvious, and I'll be having too much fun in heaven to do math. Application: If you don't want to be deceived, you need to know the truth well enough to spot and avoid counterfeits, particularly the miraculous ones. Prayer: God, I praise You for being all-wise and just; I will always trust that You know what You are doing, and will rejoice at any difficulty that comes into my life as a result of being faithful to You. Thanks that Your grace is always sufficient to do Your will. Amen. 14:1 I saw, and behold, the Lamb standing on Mount Zion, and with him a number, one hundred forty-four thousand, having his name, and the name of his Father, written on their foreheads. 2 I heard a sound from heaven, like the sound of many waters, and like the sound of a great thunder. The sound which I heard was like that of harpists playing on their harps. 3 They sing a new song before the throne, and before the four living creatures and the elders. No one could learn the song except the one hundred forty-four thousand, those who had been redeemed out of the earth. 4 These are those who were not defiled with women, for they are virgins. These are those who follow the Lamb wherever he goes. These were redeemed by Jesus from among men, the first fruits to God and to the Lamb. 5 In their mouth was found no lie, for they are blameless. 6 I saw an angel flying in mid heaven, having the eternal/of the Age gospel to proclaim to those who dwell on the earth, and to every nation, tribe, language, and people. 7 He said with a loud voice, "Fear the Lord, and give him glory; for the hour of his judgment has come. Worship him who made the heaven, the earth, the sea, and the springs of waters!" 8 Another, a second angel, followed, saying, "Babylon the great has fallen, which has made all the nations to drink of the wine of the wrath of her sexual immorality." 9 Another angel, a third, followed them, saying with a great voice, "If anyone worships the beast and his image, and receives a mark on his forehead, or on his hand, 10 he also will drink of the wine of the wrath of God, which is prepared unmixed in the cup of his anger. He will be tormented with fire and sulphur in the presence of the holy angels, and in the presence of the Lamb. 11 The smoke of their torment goes up forever and ever. They have no rest day and night, those who worship the beast and his image, and whoever receives the mark of his name. 12 Here is the patience of the saints, those who keep the commandments of God, and the faith of Jesus." 13 I heard the voice from heaven saying, "Write, ‘Blessed are the dead who die in the Lord from now on.’" "Yes," says the Spirit, "that they may rest from their labors; for their works follow with them." 14 I looked, and behold, a white cloud; and on the cloud one sitting like a son of man, having on his head a golden crown, and in his hand a sharp sickle. 15 Another angel came out from the temple, crying with a loud voice to him who sat on the cloud, "Send forth your sickle, and reap; for the hour to reap has come; for the harvest of the earth is ripe!" 16 He who sat on the cloud thrust his sickle on the earth, and the earth was reaped. 17 Another angel came out from the temple which is in heaven. He also had a sharp sickle. 18 Another angel came out from the altar, he who has power over fire, and he called with a great voice to him who had the sharp sickle, saying, "Send forth your sharp sickle, and gather the clusters of the vine of the earth, for the earth’s grapes are fully ripe!" 19 The angel thrust his sickle into the earth, and gathered the vintage of the earth, and threw it into the great winepress of the wrath of God. 20 The winepress was trodden outside of the city, and blood came out from the winepress, even to the bridles of the horses, as far as one thousand six hundred stadia. Observations: 14:1-5 It doesn't look like the world gets to be more and more Christian by the time Christ returns. With the wrath of the Lamb and the reign of the unholy trio, things are more like hell than heaven on earth. Believers will be persecuted and martyred to extinction if Satan has his way. So to provide hope and assurance to believers of all ages that persevering is worth it, particularly to those who become believers during the Tribulation, John is given a positive revelational interlude. He sees the Lamb standing on Mount Zion, from which He will execute His Millennial rule (which begins in chapter 19). With him are the 144.000 who have His mark or seal on their foreheads (from 7:3-8) rather than that of the Beast. They sing a new song before the throne, that only they can learn/express. In the Psalms a new song was sung to praise God for something He had uniquely done for the worshiper. These Tribulation saints from among the Jews had a unique role and ministry, in being the first-fruits to God. They were redeemed, and undefiled, and follow the Lamb. The “virginity” could be literal, or could refer to lack of participation in sensual pagan worship, or both. They were also blameless, and no falsehood was found on their lips. 14:6-11 A trio of angels announce the gospel of the age, from mid heaven, so everyone on earth can hear. Fearing God (being careful to do what is right in His sight), and giving Him glory (carrying out His will rather than any other, particularly our own, because He alone is worthy), is the wisest course of action in light of upcoming judgment. Fear can't be divorced from judgment, because justice is an essential part of God's character. Worship is a response to revelation (see comments on Genesis 22). The revelation of God's upcoming judgment should produce a response of being careful to do what is right in His sight. For those who fear God and give Him glory by their worshipful service, judgment is good news. A second angel announces the good news that Babylon the great is fallen. Chapters 16 and 17 will mention Babylon, but chapter 18 gives the more complete elaboration. Here the angel mentions that Babylon (either the literal city, or one that functions as Babylon did historically) has made the nations participate in her immorality (probably a reference to false worship), and thus they will share in the wrath of God's judgment. A third angel announces good news to the faithful and bad news to anyone who has received the mark of the Beast. The latter group will experience the fury and pain of God's judgment. The smoke of their “torment” will ascend forever and ever, (literally “to the ages of the ages”). 14:12-13 The recognition that those who oppress them will be overcome themselves, and the fate of those who succumb, give the saints the perseverance or endurance to keep the commands of God and their faith in Jesus, their Messiah. This is reinforced by a voice declaring the blessedness of those who die in union with the Lord. The Spirit also testifies that in contrast to those who worship the Beast, those faithful to Christ will rest from their labors, because their works will follow them in death, and result in reward (see Hebrews 4 comments on rest = inheritance/reward). 14:14-20 John sees Jesus, the Son of Man (Jesus' favorite title for Himself, the one to whom all authority was given -Dan 7:13-14), sitting on a cloud (Shekinah glory) with a sickle (Mk 4:29) to reap the production of the earth. It's possible the first reaping is of believers (Mt 3:12), since there is no mention of their fate, and the second of unbelievers (Mt 13:41), whose fate is death. The blood flowed over a distance of 200 miles, probably splashing up to the bridles of the horses (this vignette could be describing one of the earlier judgments -Rev 6 or 9). Joel 3:13 “Put in the sickle, for the harvest is ripe. Come, go down; For the winepress is full, The vats overflow --- For their wickedness is great." Application: Knowing that God's judgment is certain and fearsome, the wise person will live in light of that judgment for the glory of God. They will rest and rejoice, the others will whine. Prayer: Lord God, may I live every day prepared to face Your judgment, and be found faithful. Amen. 15:1 I saw another great and marvelous sign in the sky: seven angels having the seven last plagues, for in/by them God’s wrath is finished. 2 I saw something like a sea of glass mixed with fire, and those who overcame the beast, his image, and the number of his name, standing on the sea of glass, having harps of God. 3 They sang the song of Moses, the servant of God, and the song of the Lamb, saying, "Great and marvelous are your works, Lord God, the Almighty! Righteous and true are your ways, you King of the nations. 4 Who wouldn’t fear you, Lord, and glorify your name? For you only are holy. For all the nations will come and worship before you. For your righteous acts have been revealed." 5 After these things I looked, and the temple of the tabernacle of the testimony in heaven was opened. 6 The seven angels who had the seven plagues came out, clothed with pure, bright linen, and wearing golden sashes around their breasts. 7 One of the four living creatures gave to the seven angels seven golden bowls full of the wrath of God, who lives forever and ever. 8 The temple was filled with smoke from the glory of God, and from his power. No one was able to enter into the temple, until the seven plagues of the seven angels would be finished. Observations: 15:1-4 John sees another sign, which serves as a prelude to the final judgments contained in the seventh trumpet, the seven bowl judgments. He sees the seven angels standing by, but also sees a sea of glass (cf 4:6) before the throne. Those who overcame the Beast are standing before the throne. They are the martyrs of the Tribulation. They sang the song of Moses and the song of the Lamb. The former is probably from Exodus 15, just after the God of the Israelites overcame the gods of the Egyptians in the Exodus. The latter isn't cited earlier in the Scriptures, but a lot of the phrases can be found in the Psalms and Prophets. God is praised for deeds and the character which gave rise to them. He alone is holy, who does what is righteous. He is the King of the Nations, and therefore all will worship Him. The correct response to this revelation of Himself is to fear Him and glorify His name (14:7). 15:5-8 John sees the temple of the testimony/covenant opened and the seven angels standing ready. The temple contained the covenant or law of God which the earth had ignored, and now payback was coming. One of the four living creatures gives each angel a golden bowl/vial containing a full measure of the wrath of the God who lives/reigns forever. The plagues (described in the next chapter are similar, but not identical to those poured out on Egypt). The temple was filled with the smoke from the glory of God, and no one can enter the temple (for intercession) until the judgments were finished, indicating the certainty of the judgment. In the OT God would relent when people repented. The time for repenting was past (9:20-21; 16:9-11) and now only judgment remained for those who continued to rebel against God. Application: God is holy and righteous in all He does; if we experience His discipline, it is because we chose it, but ignoring His warnings and calls to repentance. Prayer: God, You are holy, righteous and just in all You do; help me be sensitive to what You want me to do, so I reap Your blessings rather than judgment. Amen. God in a nutshell: God has purposed to bless those who are loyal to Him, and judge those who reject Him. The choice of consequence is ours. His sovereignty is demonstrated in attaching consequences to our actions, and giving us the freedom to choose. God is holy, righteous and just in all His ways, and will be worshiped by all the earth eventually. Build-a-Jesus: Jesus redeems men from the earth and reaps the harvest of those who trust Him. He is the Son of Man to whom all authority is given, and He exercises it to the glory of God. Us in a nutshell: Fearing God (being careful to do what is right in His sight) and seeking to glorify His name (by doing His will above anything else) are good ways to demonstrate our loyalty and faithfulness to Him. Those who suffer for Him, will be glad they did. Those who don't fear and glorify Him will suffer.